In the Employees & Permissions section, click the Employee Setup link. From the Location drop-down, select the employee’s primary location. From the Role drop-down menu, select the employee’s role in the store. a. Employee: This employee generally works on the store floor or service center, and is not responsible for managing store operations. Employees cannot set up user accounts. b. Manager: This employee manages an area of store operations (e.g. a sales manager, a tech center manager, an inventory manager, or an accountant). 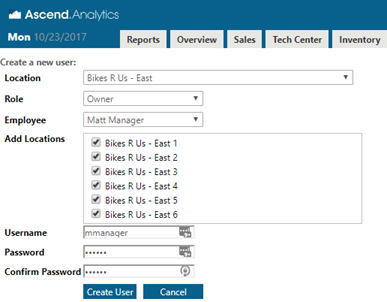 Managers can set up Employee or Manager user accounts. c. Owner: This employee manages all store operations, and should have full access in Analytics (e.g. a store owner or operations manager). Owners can set up all types of user accounts. 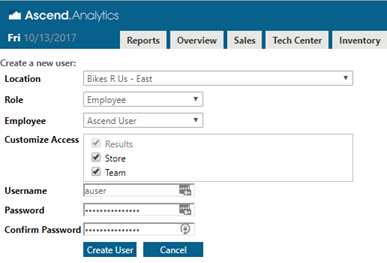 (optional) From the Employee dropdown menu, select the user account from Ascend to which to associate the Analytics account. (Owner/Manager roles) In the Add Locations section, check all other locations for which the user can see results. 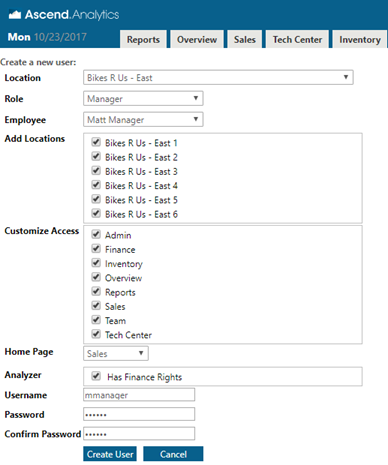 (Employee/Manager roles) In the Customize Access section, check all areas to which the user should have access. (Manager role) From the Home Page drop-down, select the page to which the user should be directed on login. (Manager role) In the Analyzer section, check Has Finance Rights if the user should be able to view financial data. In the Username field, enter the user name the employee will use to log in (e.g. first initial and last name – auser).Sherpa Tip: Username and Password are case sensitive. In the Password field, enter the password the employee will use to log in.Sherpa Tip: Username and Password are case sensitive. In the Confirm Password field, reenter the value from the Password field.Sherpa Tip: Username and Password are case sensitive.